We do not have approval for road closures so we have to keep our route inside the parks and MGT. This route, although subject to change, shouldn’t differ too much at this point. Runners start from Ashbridges Bay and travel east to Leslie, south to Unwin west to Marine Rd entering the park via the western path. 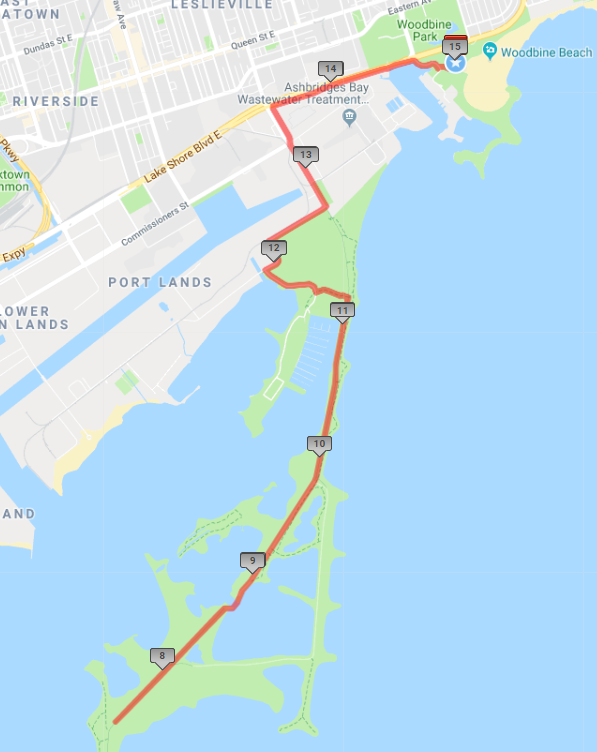 From there runners travel to the Lighthouse at the south end of the park and return to the start / finish area via the main park rd, Leslie St and Lakeshore Blvd. Since road permit has been unapproved, we will need to do a double loop of the 15k route with some slight changes. The good thing is that the entire race will be along along the MGT with no cars honking! Runners start from Ashbridges Bay and travel east to Leslie, west on Unwin and into the new trail west of the park and then into the “Spit”. Then to the Lighthouse and back to back to the start straight out the Spit. Plenty of Signage, and Marshals will be on hand to guide you! The course is basically a double loop of portions of the route shown here with one or two slight differences to make it a perfect 30k.